Illinois state capitol in Springfield. 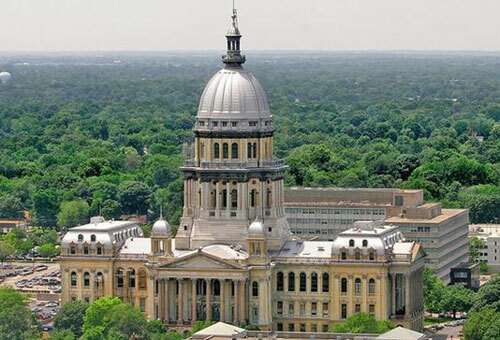 SPRINGFIELD, Ill. — The Illinois state House on Tuesday approved a bill to prohibit conversion therapy for LGBT youth. The bill prohibits licensed mental health care providers from engaging in sexual orientation change efforts with anyone under the age of 18. Sexual orientation change efforts are defined by the bill as any treatment or practice that seeks to change a person’s sexual orientation or gender identity. There was no debate on the measure before it was approved by a vote of 68-43. The bill now goes to the Senate for approval. Just last year, the House defeated a similar plan 44-51 — with 22 members not voting. The legislation does not apply to religious leaders and would not impact the ability of clergy to practice their religion. California, New Jersey and Washington, D.C. have already enacted such bans and on Monday, Oregon governor Kate Brown signed a bill to prohibit the practice there as well. The U.S. Supreme Court has refused to hear challenges to both the California and New Jersey bans.